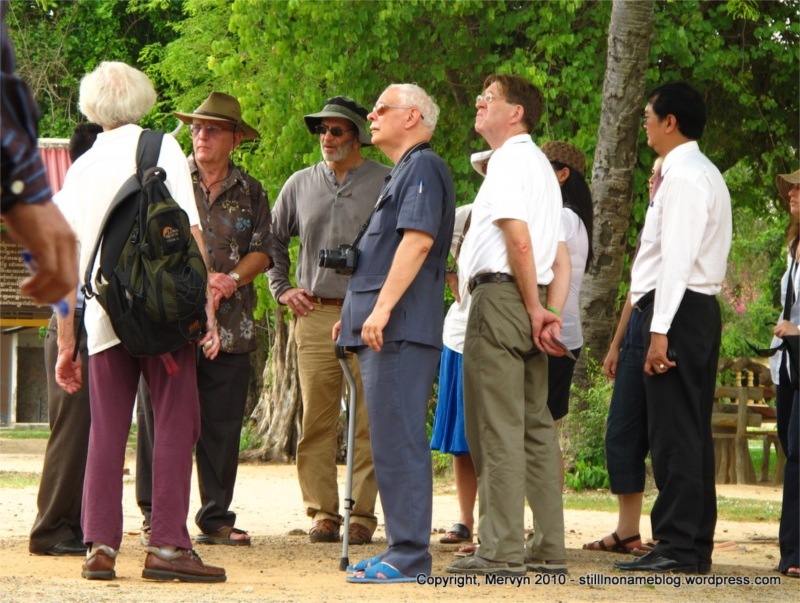 After Tuol Sleng yesterday, I jetted out to try and find the Killing Fields. It was supposed to be 15 km southwest of Phnom Penh and—as Lonely Planet put it—“clearly marked.” Because it was supposed to be easy, I immediately got lost. One wrong turn an hour later, I found the right road. It was a race against the clock. 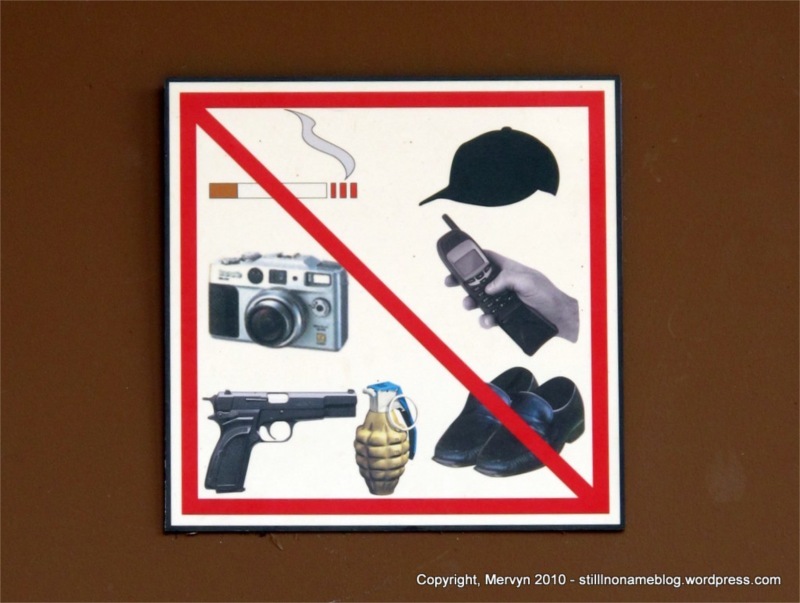 It was 4:30 p.m. and the unfortunately titled Choeung Ek Genocidal Museum closed at 5:30 p.m. I never found it. I committed to coming back early the next morning to beat the heat. And so, I did. Again, though, I missed the correct road. I drove around Phnom Penh looking for my street. Then I spotted two White people in a tuk tuk. 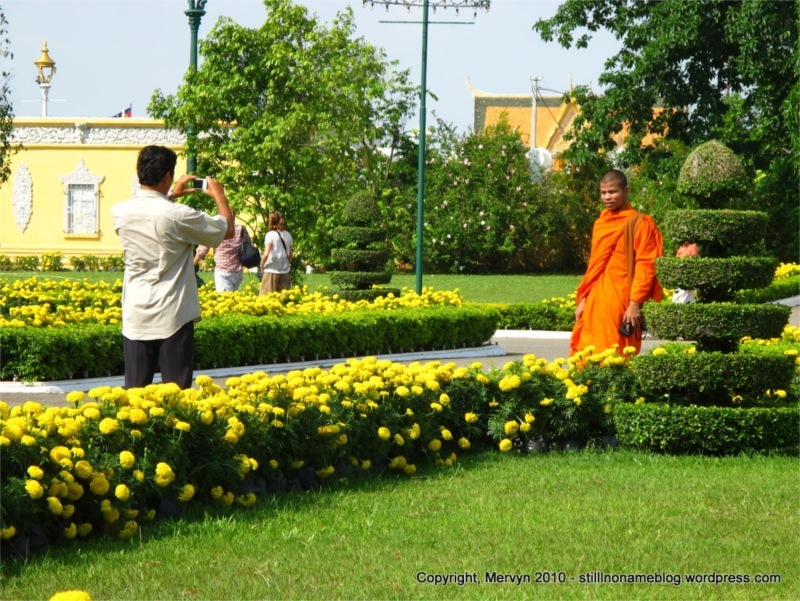 They seemed to be headed in the general direction of Choeung Ek so, following my rule of thumb, I followed the tourists. After a couple turns, I was on the main road. This stuff works even when you’re on a bike! I zipped past and silently thanked them for their service. I started to count down the kilometers. Right at 15 km, I saw a large sign on the left side of the road. The kind you can’t miss unless you’re me. Down a small side road I found the old Chinese cemetery that the Khmer Rouge used to kill upwards of 20,000 people. I was one of only a couple people there. After viewing an awkwardly translated movie about the site, I walked the grounds. Just like Tuol Sleng the day before, I was struck by how small the place was. Looking at one depression in the ground, I couldn’t believe they’d fit over 400 people in the mass grave. The signs filled me on the details. At its height the Khmer Rouge were killing 300 people a day here. So many that they had to construct a holding cell because of the backlog. They would use whatever was handy to do their dirty work: shovels, axes, picks, scythes, knives. They’d dump the bodies into the pits and sprinkle them with DDT. They used the chemical to cover the smell from the surrounding farmers and to finish off anyone who might be still alive. I walked the paths between the graves. The archeologists decided not to excavate every grave. Perhaps it would have been too much work. Perhaps it would have disturbed the site too much. Regardless that meant there were still teeth and bone fragments coming out of the ground. 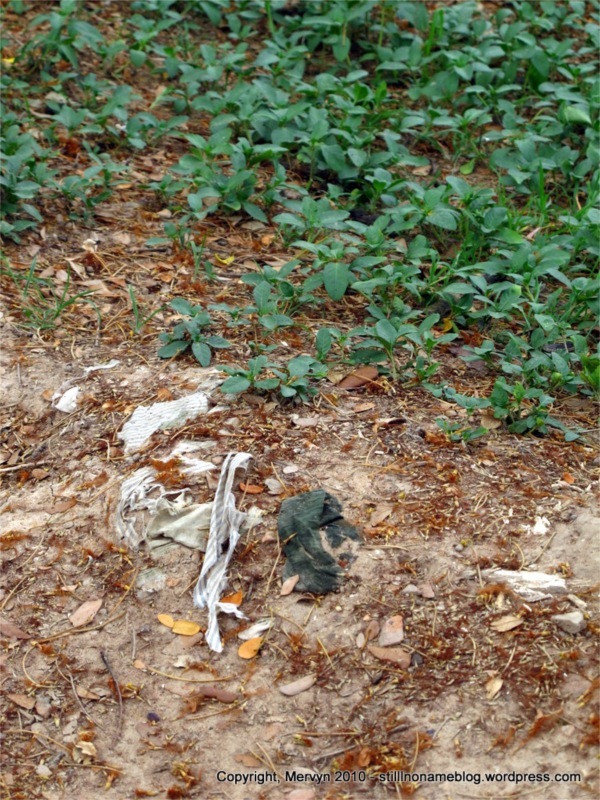 Pieces of clothing poked up through the vegetation. 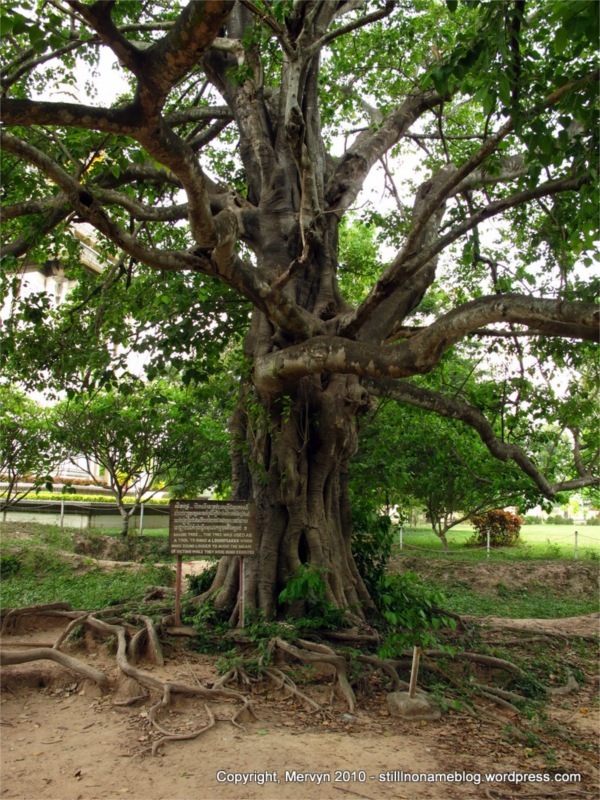 There was a large tree on the site, just like the one at Ta Prohm. Its roots twisted around themselves and stretched out over the ground. 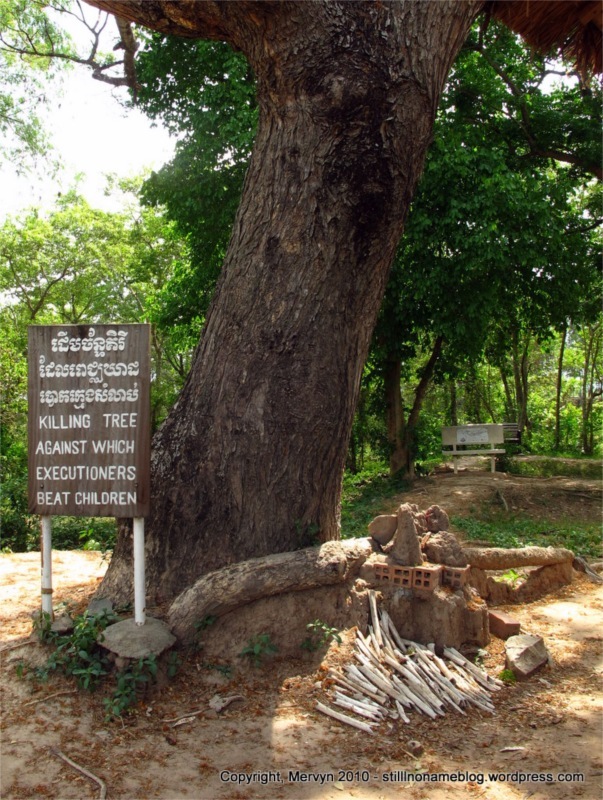 The Khmer Rouge hung speakers from this “magic tree” and played music to drown out the sounds of their work. Under a wooden covering next to a large tree sat one of the most chilling graves. This grave held the bodies of 100 women and children. The Khmer Rouge chose to kill whole families to prevent the revenge blowback. That meant killing babies and their mothers. They forced the mothers to sit on a tree root and watch as they disposed of the kids. The cruelty here was something I couldn’t believe. The executioners had lost all humanity, compassion, and pity. They would play with the kids, sometimes even getting them to laugh. Then they’d make bets on who could hit their impromptu clay pigeon. Sometimes they’d miss. Sometimes they didn’t. Eventually, the results were always the same. If they got bored with that, they beat the babies against the trees. The guide claimed that many mothers died of heart attacks. I have no reason to disbelieve him. I’ve been to Holocaust sites before. I’ve seen the evil that man can do. For some reason, this felt different. I’m not sure if it was because the people were Brown. I don’t know whether it’s because this wasn’t Germans on Jews but Khmer on Khmer. I’m not sure if it was because there felt like there was more tangible evidence, what with the bones and clothing still fighting their way to the surface. It could be that this feels more real because it happened in my lifetime, not long long ago in a World War far away. I’m not sure why, but it felt different. Eerie. I had a harder time distancing myself from what happened. It felt very real. Journalists covering journalists. Quite postmodern. 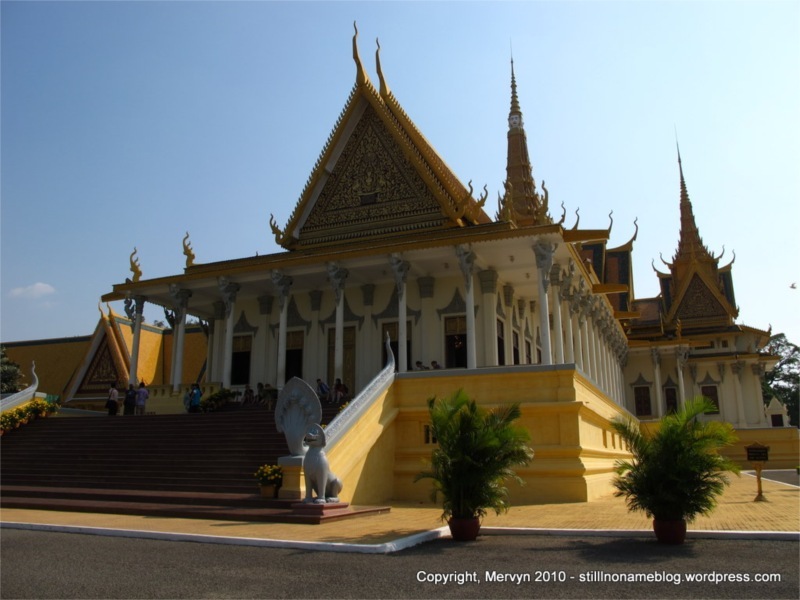 I headed back to Phnom Penh. I sat at a street side food hawker stand sipping on water, trying not to sweat, waiting for the Royal Palace to open at 2:30. At 2:45 I walked towards what I thought was the entrance. A young tuk tuk driver asked me if I needed a ride. I said I didn’t. He then asked the standard, “Where you from?” I humored him as I walked and said, “Philippines.” Sometimes it’s just easier than trying to explain why I’m brown and American. Turned out he just wanted to talk. We chatted about women, getting an education, Cambodia, and travel. He was very friendly. He said he’d like to go to school but he couldn’t afford the $600 a year tuition. I played sympathetic, but it was depressing to know that what stood between this man and a better life was what I used to make for the firm in a little over an hour. The tuk tuk driver pointed me the correct entrance. We said our goodbyes and I headed back where I came. That’s when I played a thief. I accidentally walked in through the exit and found myself in the palace. I did not do this on purpose. Somehow, though, I was in for free. To atone for my sin I donated heavily to Buddha. 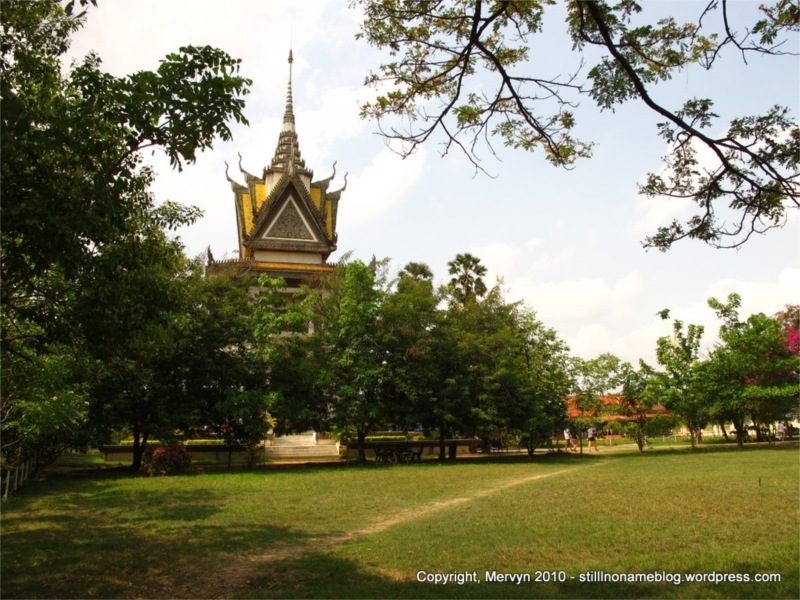 The palace stood in stark contrast to what I’d seen at the Killing Fields and what I’d discussed with the tuk tuk driver. The gardens were immaculate. The halls and temples were impressive. 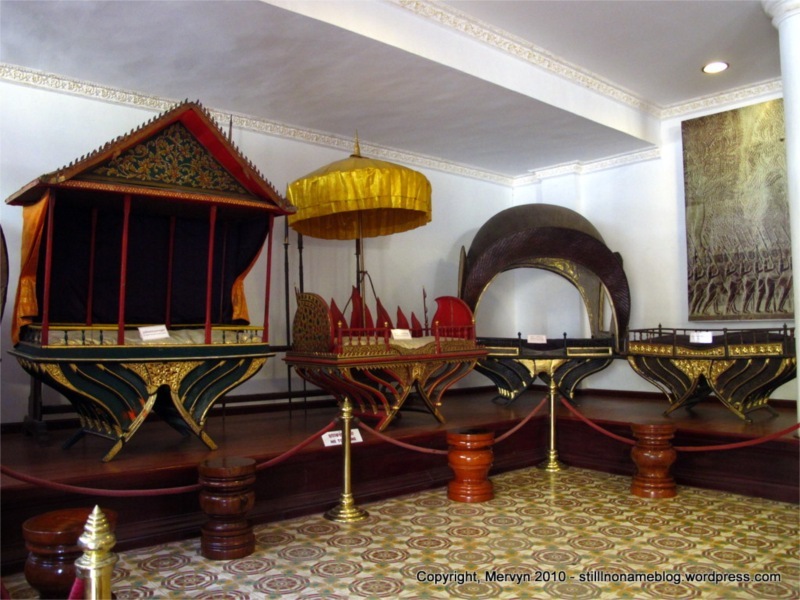 The king had been reinstalled some time after the Khmer Rouge fell. The palace felt like it was new. You could almost see the fresh coat of paint. They even had their own emerald Buddha. I could get a lot closer to this one, but, like the one at Wat Phra Karew, I wasn’t allowed to take pictures. 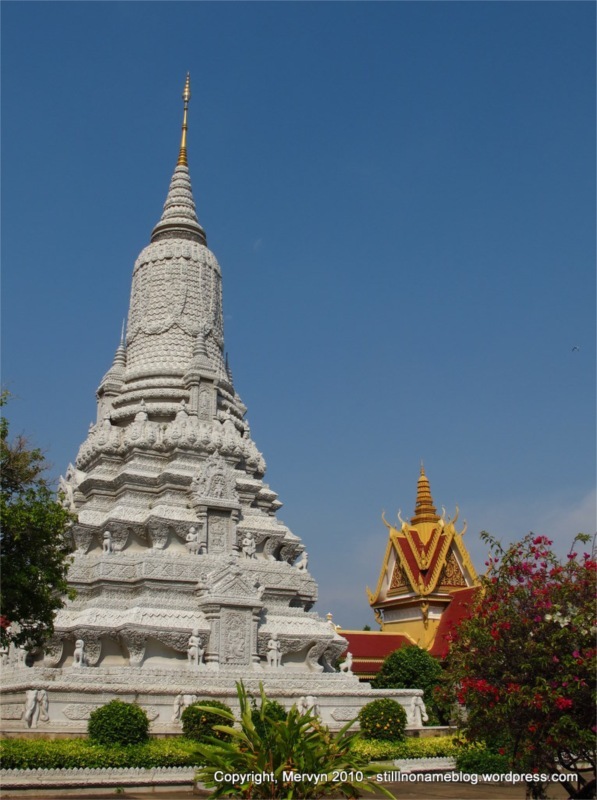 The floor of the emerald Buddha temple had tiles of pure silver weighing in at a total of 50 tons. Most were covered with rugs for protection. Some were exposed. For some reason it looked like a few were duct taped down. Fifty tons of silver and they couldn’t find something more ornate than duct tape? Strange. I hung out on the riverbank watching the sunset. This really is a country of contradictions and of nuance. There are things here churning under the surface. Khmer killing Khmer in the name of Communism just a few decades ago. Now the country tries to move on. The population is mostly poor, but they have reinstalled a king who lives in a lavish palace. The streets are clean, but the tuk tuk driver says that this is what the government wants me to see. If I go to the provinces, it won’t be like this. The traffic is chaotic, but even that has an underlying order. People seem to be running game but, at the same time, seem genuinely friendly. I still don’t know what to make of this place.